Hui Press, Makawao, Hawaii. 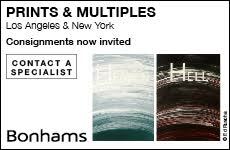 Courtesy of the artist and Catharine Clark Gallery, San Francisco. Los Angeles artist Sandow Birk (b. 1962) is driven to restage art from the past to speak to contemporary concerns. Two projects, created over the past decade, address the current American conceptual haze in which Islam, terrorism, war and war crimes waft together, fanned by politicians of various stripes. 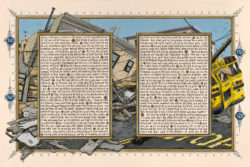 The first of these works—begun in 2005—was Birk’s American Qur’an, a nine-year-long undertaking in which he calligraphed and painted 427 pages, setting an English translation of the Arabic text of the Qur’an against scenes of contemporary American life. (In addition to the drawings, American Qur’an is also available as a trade hardback. )1 The second project, done in 2007 in the middle of the ongoing American Qur’an development, is a set of 15 monumental woodcuts, The Depravities of War (2007), that follow the 17th-century example of Jacques Callot’s etching series Les Misères et les Malheurs de la Guerre (The Miseries and Misfortunes of War). He sought out material on historic Qur’ans in California and made a trip to the Chester Beatty Library in Dublin, which boasts one of the most important collections of Qur’ans outside of the Middle East. Seeing cases and cases of Qur’ans spanning hundreds of years was transformative, and Birk set about creating an illuminated Qur’an for a mainstream American audience. In other words, for people just like him. As he set about creating the gouache drawings to accompany the book’s 114 Surahs (chapters), he chose to retain many traditional Qur’anic elements: the pages all adhere to a uniform layout, in which the handwritten text is set within elaborate borders. He also diverges from tradition in important ways. Sandow Birk, Execution from The Depravities of War (2007), woodcut on handmade Sekishu Kozo paper, 48 x 96 inches. Printed and published by Hui Press, Makawao, Hawaii. Courtesy of the artist and Catharine Clark Gallery, San Francisco. Most radically, the text on those blocks appears in English. Birk is cognizant that an English-language Qur’an is a contradiction in terms. The Qur’an is held by believers to be the word of God, spoken in Arabic to Muhammad. And while Muslims may rely on translations in their native tongues as an aid to studying the text, prayers across the Muslim world are recited in Classical Arabic, which remains the official language of the Qur’an. (The Christian Bible, by contrast, began as an accumulation of texts written in multiple tongues, and can be read in hundreds of languages today.) For Muslims, the English text that appears on Birk’s pages without Arabic accompaniment can only be considered an interpretation of the Qur’an. The text does, however, conform to tradition in being written by hand. The calligraphic styles that developed over the centuries to embody the Arabic of the Qur’an are central to Islamic visual and religious culture. Seeking an analogous tradition of letterform stylization within his own world, Birk settled on and adapted local Los Angeles graffiti, in which he saw similarly lyrical and expressive visual qualities. In most Qur’ans the text is surrounded by intricate abstract ornament, but on each of Birk’s pages the text blocks appear to hover in front of a single, coherent, narrative scene. In the spaces surrounding the text, we catch glimpses of the mundanities and extremes of American life—construction sites, street corners and RV parks; a prison execution chamber, natural disasters, US Customs and Border Patrol detainment. Each scene was conceived by the artist as he thought about the relevant Surah and how its message applied to 21st-century American life. Surah 58, which addresses both divorce and public assembly, is paired with a scene of people waiting in a laundromat. The two blocks of justified calligraphy, framed with simple blue and gold borders, float symmetrically on the page. An outer border, surrounding the drawing as a whole, is disrupted by dryers, fluorescent lights, laundry baskets and a woman in pink on a yellow plastic chair, who sits reading with a book in one hand, a phone in the other and coffee cup close by. Behind her we can read the backward message of a sign taped to the inside of the window: “FREE WI-FI.” Between and around the text blocks we can see snippets of carts, washing machines, a bulletin board, the feet of a person standing folding clothes. Contrast this quotidian scene with the one that accompanies Surah 14 C, a text that speaks about the destruction God may visit upon people: here the foreground is awash in the debris of a tornado that can be seen still churning in the distance—the splintered remnants of a house pile up and spill over both the outside border and the inner frames that generally protect the calligraphed text. Birk’s drawings make no comment on the situation of Muslims in America: he has neither replicated stereotypes nor tried to counter them (which may just result in their perpetuation). Instead, American Qur’an presents a variety of shared experiences. And yet, their very existence as narrative scenes is potentially provocative. Jacques Callot, La Pendaison [The Hanging Tree] from Les Miseres et les Malheurs de la Guerre [The Miseries and Misfortunes of War] (1633), etching, 8.8 x 19.2 cm. Published by Israël Henriet. ©Victoria and Albert Museum, London. Representational images of living beings are controversial in Islamic religious art. While representation per se is not forbidden in the Qur’an, idolatry—any confusion of a representation with God—is. (Aniconism exists in Judaism on a similar basis, and has existed with greater fluctuation in Christianity, notably in Byzantium and during the Protestant Reformation.) Unsurprisingly, since the Muslim world covers much of the globe, attitudes to representation differ—Shias, for instance, tend to be more open to respectful representational images of humans than Sunnis.3 Yet Birk, interestingly, has found that questions about representation in American Qur’an have been brought up to him almost exclusively by non-Muslims. 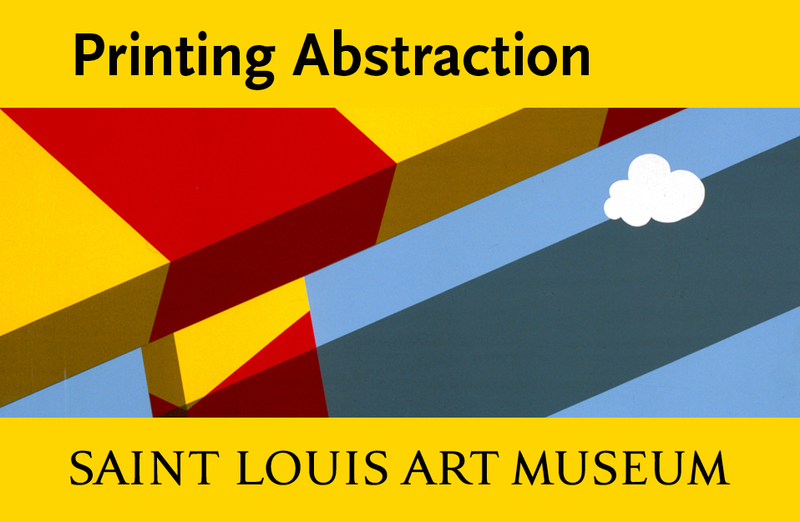 The project has been exhibited several times, in various stages of completion, at galleries—Catherine Clark Gallery in San Francisco, PPOW in New York and Koplin del Rio Gallery, then in Los Angeles—and on university campuses.5 From the beginning it has attracted a good deal of press, including coverage in the New York Times and the Atlantic. Early news of the project elicited words of caution from some Muslim religious leaders, and Mohammad Qureshi, the administrator of the Islamic Center of Southern California, announced his refusal to see the work altogether.6 There have also been negative reactions from those on the right that feel that “American” and “Muslim” are mutually exclusive identities, and those on the left who argue that a non-Muslim white surfer from Southern California has no place appropriating a sacred text that is not his own. The project has been met with support from a younger generation of American Muslims who have seen the work and for whom those terms are just two of many identifiers. All these responses are part of the conversation Birk aimed to provoke. American Qur’an is an attempt to defuse intercultural fear and loathing by integrating the foreign and the familiar; the large scale project Birk took up partway through his work on the Qur’an, The Depravities of War, is a grandiose account of what happens when such efforts fail. Both are hugely ambitious: American Qur’an is expansive in the number of works, while the Depravities are physically enormous: 15 four-by-eight-foot horizontal woodcuts that chronicle the American invasion and occupation of Iraq. Like many Americans, Birk was dismayed by the war—the false pretenses and ambiguous goals with which it was launched, the brutality, chaos and suffering that ensued. In 2007, when the number of American troops was increased by 20,000 in the “surge” intended to secure Baghdad and Anwar province, Birk turned for inspiration to Callot’s famous 1633 etching series, The Miseries and Misfortunes of War.Callot witnessed and portrayed the impact of the Thirty Years War, which ravaged Europe between 1618 and 1648, on his hometown, Nancy, the capital of the disputed territory of Lorraine, and his series marked a major, early example of printmaking used to investigate and display the cruelty and chaos of conflict. Sandow Birk, Detention from The Depravities of War (2007), woodcut on handmade Sekishu Kozo paper, 48 x 96 inches. Printed and published by Hui Press, Makawao, Hawaii. Courtesy of the artist and Catharine Clark Gallery, San Francisco. Like the Miseries, Birk’s Depravities opens with an elaborate frontispiece—a colophon at the scale of cinematic opening credits—but the story begins with the print titled Obsession. The action in the images moves from upper left, where a plane is seen heading toward the Twin Towers and smoke billows from the first hit, to left center, where a loose grouping of people read newspapers headlined “MWDS” and “IRAQ 9-11.” To their right, soldiers march in formation (one salutes a parental couple; another embraces a woman as a small child tugs on his pant leg). Signs for McDonalds, Exxon, Texaco and Chevron hover above the tree line while Chinook helicopters rise into the air. Finally, in the lower right, closest to the viewer, stands an Army recruiting table with signs reading, “Enlist Army, Free College,” and “Don’t Ask Don’t Tell” on the other. Obsession is predictive of the compositional complexity and narrative density of all the prints in the series, which follows the course of the conflict: the training of troops; the full-scale invasion, with tanks and burning oil fields; the struggle of street-by-street combat with the insurgency; destruction and despoliation; the abuse of prisoners by American forces. Birk drew on Callot’s compositional elements and narrative arc, but opted for radically different scale and technique. Callot’s etchings are famously minute: roughly four-by-eight inches each; Birk’s woodcuts are printed from four-by-eight-foot sheets of birch plywood (the largest matrices that could be sourced in rural Hawaii, where Birk was working with master printer Paul Mullowney at Hui Press).7 Callot’s prints are rife with virtuosic technical invention, using acid to bite longer in some areas than others to create depth of field.8 The deft draftsmanship and powerful content of Callot’s prints reward the close, intimate scrutiny of traditional print viewing—held in the hand or close to the eye. The monumental size of Birk’s prints, and the coarser, more visceral, gouging of wood to make the marks of the image, create a dominating physical presence. The subjects in The Depravities are boldly rendered, the atmosphere expressive, and the mark-making aggressive. 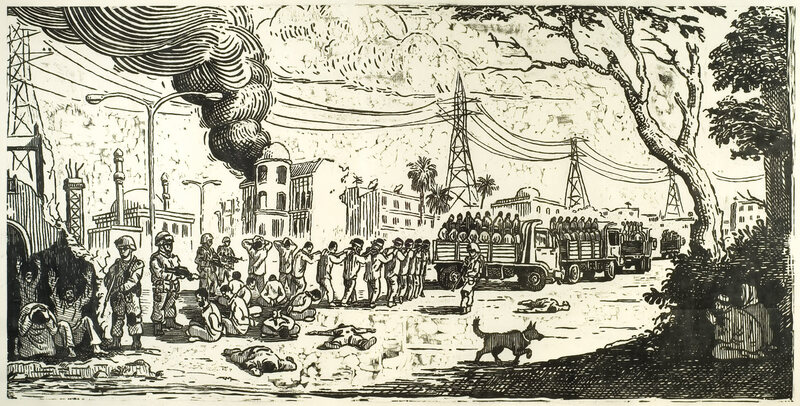 Using the strong hatching and articulate outlines typical of didactic wood engravings, Birk builds a full tonal range, from the billowing black smoke of oil fires to the bright light of a U.S. Senate hearing, and to define precisely the figures of fleeing civilians, dead bodies and soldiers crouching behind Humvees. 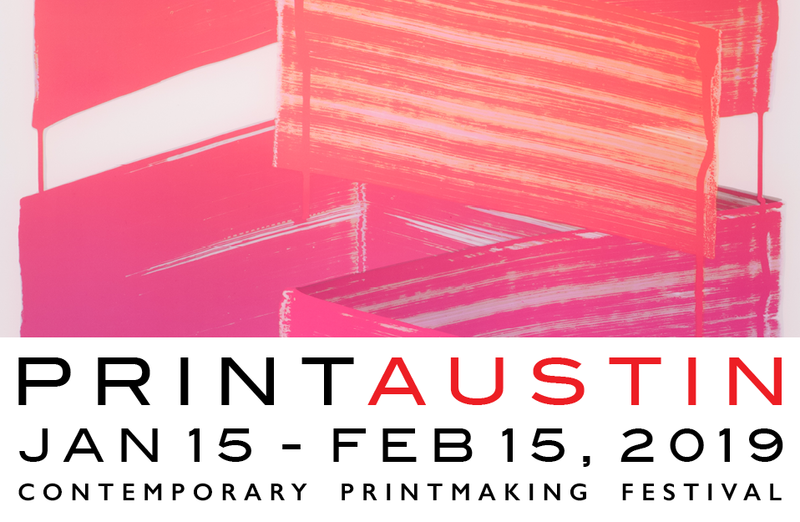 The prints are loud—designed to compete in a media landscape saturated with depictions of violence. Standing in front them, viewers are immersed in each scene. 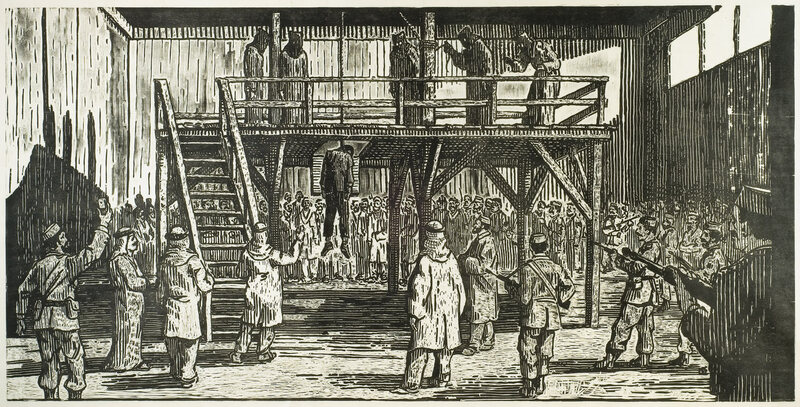 One of the remarkable aspects of Callot’s series is its depiction, not of heroes and villains, but of the many shades of violence, condoned and condemned.9 Take, for instance, its best-known image, The Hanging, which shows a tree from which dozens of bodies dangle like ripe fruit: the subject is not, as often assumed, a massacre of civilians by an invading force; it is the townspeople’s revenge on soldiers who plundered and tortured. Birk also acknowledges the moral complexity of the situations he addresses. The penultimate print, Execution, a late addition to the series, shows the lifeless body of Saddam Hussein hanging amid a crowd of people who had been victims of his regime. The denouement of Birk’s series is prolonged, much like the conflict—fighting gives way to prisons and punishment, and then again to fighting, suggesting intractable violence with no tidy victory. The final print shows a line of disabled veterans outside a Veterans Services facility; read left-to-right and top-to-bottom, the concluding figure of this monumental drama is a homeless man slouched in the shadows beside his empty supermarket trolley. 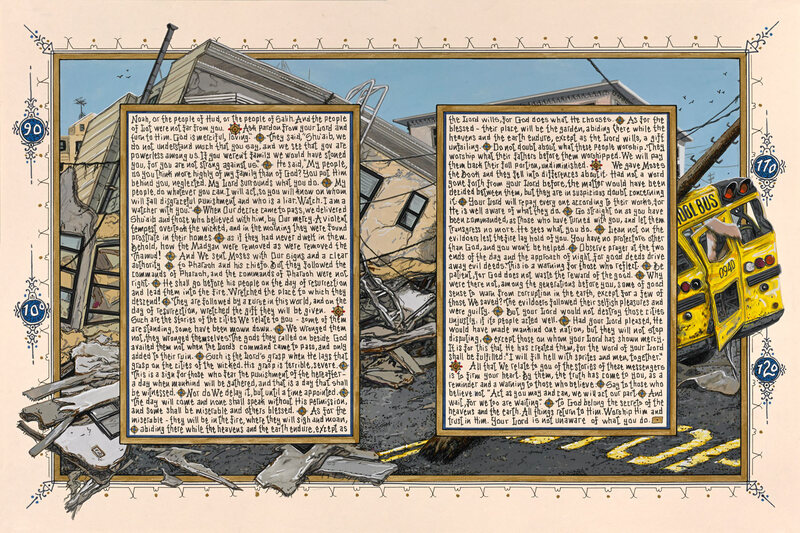 Sandow Birk, American Qur’an/Sura 11E (2014), ink and gouache on paper, 16 x 24 inches. Courtesy of the artist and Catharine Clark Gallery, San Francisco. As with his Qur’an project, Birk’s personal relationship with the subject of this series is a distanced, mediated one. Callot lived through the fight for Lorraine during the Thirty Years War; he was reporting things he had experienced. Goya lived through the Peninsular War and captioned plate 44 of his Disasters of War, “Yo lo vi” (I saw it). The same might be said of the World War I prints of Käthe Kollwitz and Otto Dix. Birk’s source materials were not personal observations, but photographs shot half a world away, digitized, cropped, processed, printed—things he saw on the pages of the Los Angeles Times that arrived on his doorstep each morning. It was the way most Americans “saw” the war, and Birk used that language to process the experience. The Depravities does not seek to provoke the visceral discomfort of Dix’s worm-eaten skull or Goya’s mangled corpses, or the shock of the news photographs themselves. Instead its monumental dramatic sweep offers a colossal tragedy of wasted resources, opportunities and lives. American Qur’an and The Depravities of War are commentaries on 21st-century America and its complicated engagement with the Muslim world. But in his adoption and adaptation of art-historical precedents, Birk reminds us that the challenges of our specific moment are both novel and familiar, reiterating struggles of the past with a few new cast members—and that we would do well to remember that there is a larger arc of history beyond the 24-hour news cycle.